Posted by Making A Mark on Wednesday, August 31, 2011 2 comments Who's linking to this post? 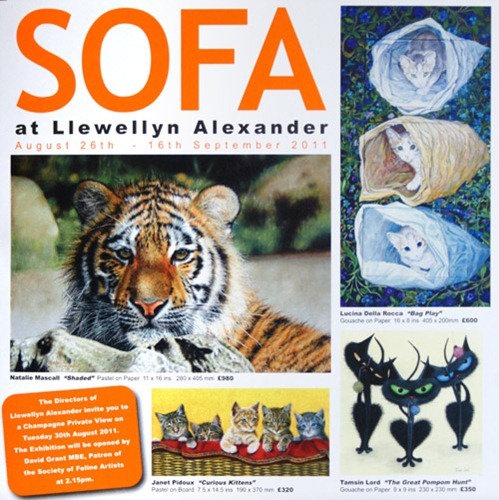 Jacqueline Gaylard won the Llewellyn Alexander SOFA Award for 2011 at the Private View of the Society of Feline Artists Annual Exhibition at the Llewellyn Alexander Gallery in Waterloo this afternoon. Her handling of the subtleties and colour tones of the fur in the acrylic painting of a blue cream British Shorthair cat is superb. While clearly being a painting it's as if this is a living breathing cat. 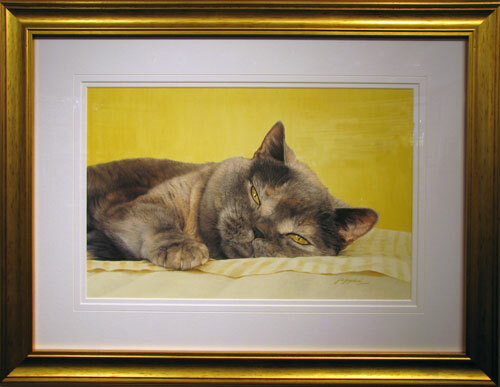 This is a cat which has frequently featured in Jacqueline's paintings before now but this paticular painting is especially appealing. Jacqueline was displaying a suite of top notch work - with her five other paintings also setting an equally high standard of both composition and execution for others to emulate. She's also an artist who pays meticulous attention to backgrounds! Posted by Making A Mark on Tuesday, August 30, 2011 0 comments Who's linking to this post? 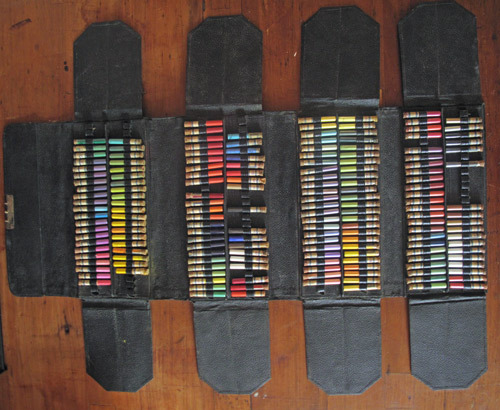 I have a conundrum for you - which will appeal especially to those who know about pigments and art materials. Can anybody tell me and photographer Peter Hunt what is the object (case and phials) in the three images you can see below? It appears to be some form of pigment - contained in numbered glass phials with a cork stopper, in a leather container which folds up into a neat box. Why is (the pigment?) contained in this way? Posted by Making A Mark on Monday, August 29, 2011 19 comments Who's linking to this post? 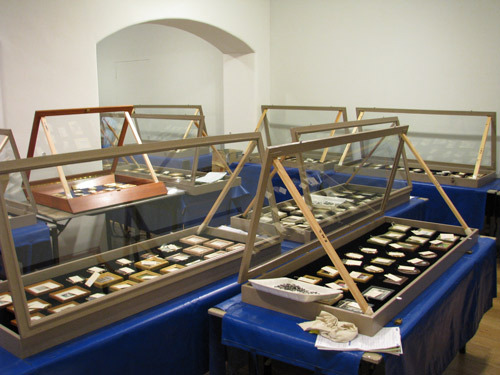 This week I got to see what goes in to setting up an exhibition of Miniature Artwork when I visited the Mall Galleries on Tuesday to see Bite: Artists Making Prints - the new Printmaking Exhibition. The North Gallery had been taken over by The Royal Society of Miniature Painters, Sculptors & Gravers who were preparing selected miniatures for their Annual Exhibition - which opens in October. I also learned about a very special loan exhibition concerning Royal Portrait Miniatures which I'll be writing about next week. Posted by Making A Mark on Sunday, August 28, 2011 3 comments Who's linking to this post? Categories art, art blogs, Art Business and Marketing, art competition, art society, creativity, exhibition, exhibition review, opinion poll, print-making, printmaking, who's made a mark this week? The winner gets a £5,000 bursary to spend on the project of their choice - as described in the proposals which won the award. The Travel Award always seems to get neglected in the avalanche of coverage for the main BP Award - however its winners have proved over time to have become some of our top painters. 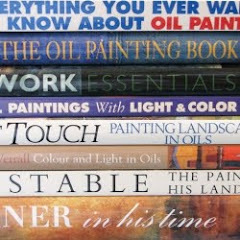 It's also far more interesting in that it involves a project and typically more than one painting of more than one person! Exhibition Review: BP Travel Award 2008 - Emmanouil Bitsakis. Now on to this year's artists - and looking forward and looking back. Posted by Making A Mark on Saturday, August 27, 2011 1 comments Who's linking to this post? 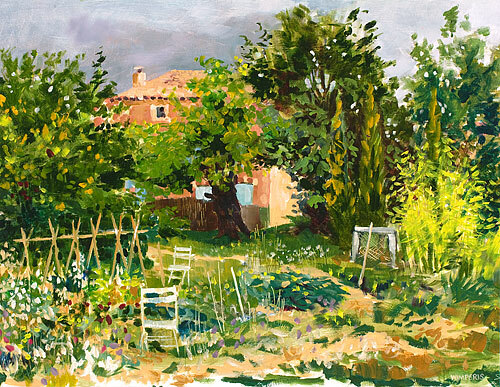 Yesterday I realised that my normal listing of all those artists selected for the BP Portrait Award Exhibition 2011 had been "bounced" by preparation for painting in Provence. Here then is the "added value" list of all those artists selected for the BP Portrait Award. 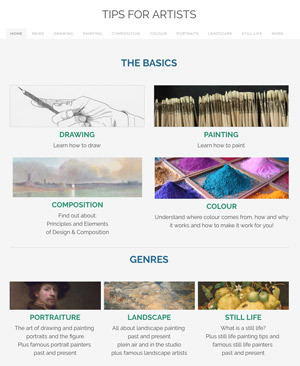 For those uncertain as to whether their artwork measures up to the art competition, it's useful to review the websites of selected artists in order to assess the standard of work done by selected artists. However do bear in mind that websites can be very deceptive as to the size of work. artists with names in bold either have their own website or a proper gallery website which features their paintings - where you can see more of their work. 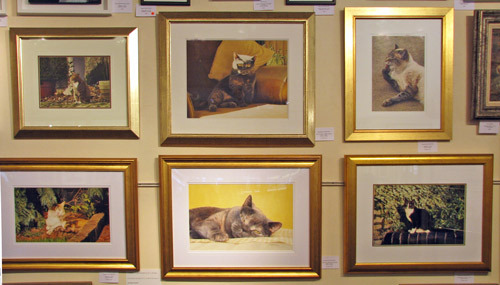 non-bold names have a link to their page on the exhibition website where you can see their entry (but no other work). split the selected artists up by continent/country - allocated, broadly speaking, to the country where they are now based or are now associated with. I may have got this wrong. If so, shout out and I will correct. highlighted if artists have won any prizes in previous years. I'll maybe come back and crunch some numbers having now got them sorted - but right now I want my dinner! Posted by Making A Mark on Friday, August 26, 2011 0 comments Who's linking to this post? The National Portrait Gallery has recently announced that the BP Portrait Award Exhibition 2011 has been the most popular exhibition in the Gallery’s history. I visited it on Tuesday - and the gallery was absolutely packed! Exhibition dates and tour: You have about just over three weeks left if you'd like to visit the exhibition in London - it closes on 18th September. After this, the winners and selected entries will tour to Wolverhampton and Aberdeen. I feel strangely detached from the BP Portrait Award this year as I was in Provence when the winner was announced - and consequently was not at the Awards ceremony which I've attended for the last few years. Hence no photos of the exhibition or video this year - and it also perhaps explains why it's taken me so long to go and see it. 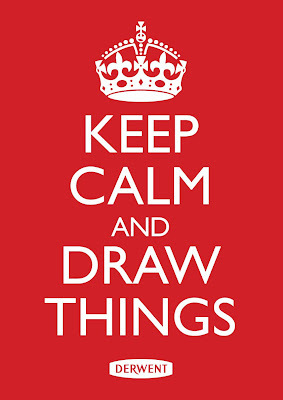 Posted by Making A Mark on Thursday, August 25, 2011 3 comments Who's linking to this post? Bite or BITE: Artists Making Prints is a brand new exhibition about contemporary prints. It comprises a mix of 'eminent names' (e.g. Michael Craig-Martin and Sir Peter Blake) with those of artists whose work is selected through an open competition. 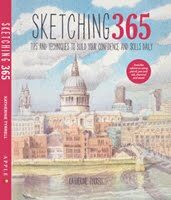 It creates a 'draw' for those who like to see work by the famous and an opportunity to come away very impressed by the work of the rather less famous. I have to say I really couldn't tell the difference between the two! Now for about the show in detail. Posted by Making A Mark on Wednesday, August 24, 2011 4 comments Who's linking to this post? 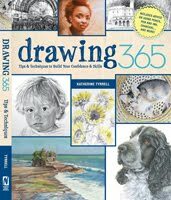 Do you want to learn how to draw? 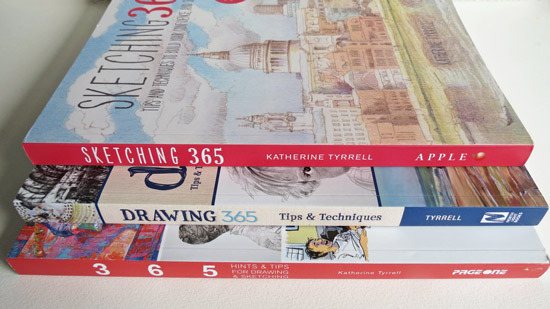 Or maybe you'd like to improve your drawing skills? If you do, this website will be of interest to you. Posted by Making A Mark on Tuesday, August 23, 2011 7 comments Who's linking to this post? Posted by Making A Mark on Sunday, August 21, 2011 6 comments Who's linking to this post? As September comes into view on the calendar, we always seem to get a small explosion in exhibitions by art competitions, art societies and and art trails by art groups. People are back from their holidays and ready to look at art! I'm currently getting my calendar sorted for the London Exhibitions so have made a note of the ones I'm planning to visit. I've also included below a note of all the major exhibitions elsewhere in the country and Art Trails and Open Studios that I'm aware of. If you have one and it's not listed please let me know and I'll be happy to add it in as this post will be added to the Major UK Art Society Exhibitions page at the top of this blog. 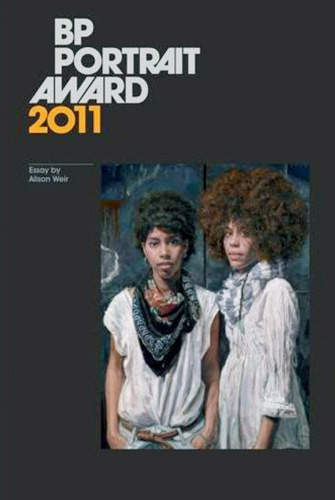 Jerwood Drawing Prize - Jerwood Space, London from 14 September - 30 October 2011. Posted by Making A Mark on Saturday, August 20, 2011 5 comments Who's linking to this post? 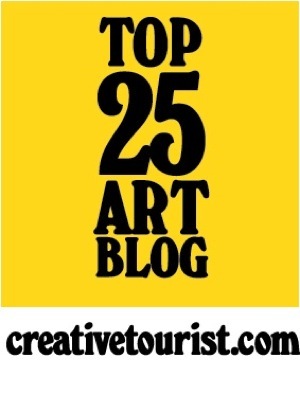 Creative Tourist have updated their listing of the top 25 art blogs in the UK and Making A Mark remains at #3! If you try visiting the blogs, you'll note that each has defined its own niche and perspective on the artworld and nobody is trying to copy anybody else! There's a message in there somewhere! Posted by Making A Mark on Friday, August 19, 2011 8 comments Who's linking to this post? 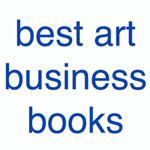 Categories art, art blogs, Art Galleries and Museums, artist, makingamark, who's made a mark this week? 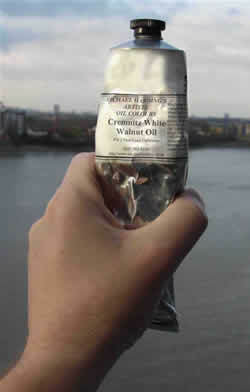 Posted by Making A Mark on Thursday, August 18, 2011 2 comments Who's linking to this post? 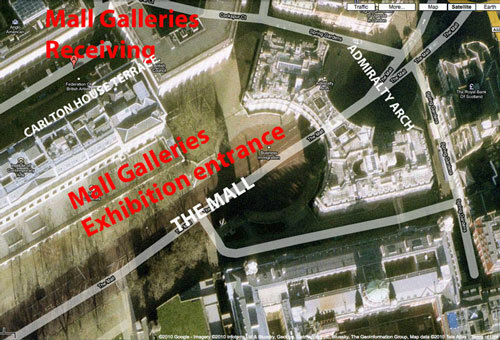 High Watermark opens today at the Mall Galleries and runs until 3pm on Saturday 20th August. I was at the Private View yesterday and this thread contains some images of the exhibition and my thoughts on it. This is the way the exhibition is described. 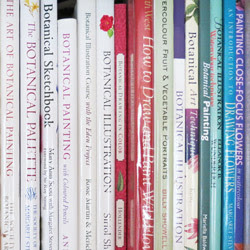 The Royal Institute of Painters in Water Colours (RI) and the Royal Watercolour Society (RWS) are joining forces once again to promote the very best of British watercolours and fresh work in water-soluble media – a highlight of the summer calendar. 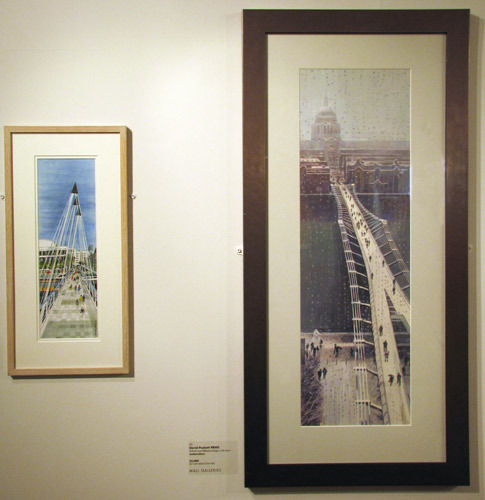 Exhibition organised in association with Bankside Gallery. The exhibition fills the West gallery (only) and displays a variety of media and styles. It's well hung - grouping paintings by members of both societies into small clusters characterised by either palette or subject matter or style. Its punctuation by blue paintings can clearly be seen when viewed from the entrance level. Now for more about the exhibition in terms of the paintings! Posted by Making A Mark on Wednesday, August 17, 2011 6 comments Who's linking to this post? Posted by Making A Mark on Monday, August 15, 2011 4 comments Who's linking to this post? It would have been nice to have been in Cornwall this week. 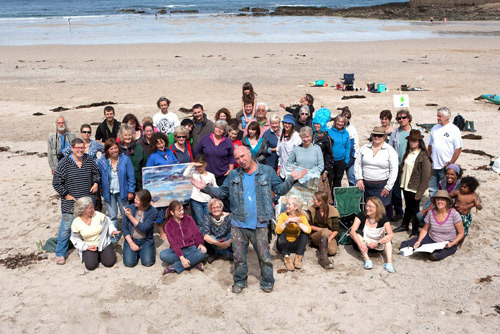 For one thing I could have been painting on the beach yesterday - during the Big Cornwall Paint In. This week has been just plain weird. Initially, events in London completely threw me and totally disrupted my sleeping patterns. Yet now everything has returned to being totally and utterly normal, it's really quite difficult to remember just how frightening it was on Monday night. Some 25 years ago my immediate neighbour and friend David Hodge was photographing the Brixton Riots when he got hit over the head. Two weeks later he died of the injuries he sustained in the riot. He was really unlucky. However it's good to recognise that - just like the phoenix - good things do come out of adversity. Out of David's death 25 years ago came an award for photographers. The Observer Hodge Photographic Award was established in 1986 to promote documentary photography by amateur, student and professional photographers under the age of 30. It provided a unique way for photographers to get "a break" which could help establish their careers. Over the course of 20 years it became a very prestigious award but, sadly, I think it finished in 2006 on its 20th anniversary. The "broom brigade" which burst spontaneously out of Twitter on Monday night led to the hashtag #riotcleanup outranking #londonriots before the end of the night as people focused on how to get back to normal. What's more they all turned up the next day and got stuck in! There have also been some interesting television programmes and debates which have attempted to listen to a variety of different perspectives to understand better why the riots happened. It's also been good to see some really outstanding community leadership - such as that demonstrated by Tariq Jahan, father of Haroon, one of the three men run down and killed by a car in Birmingham while protecting his community from looters. Surely that must set a standard for others to follow? We can but hope. I think over the course of the next year I'm likely to see a fair bit of visual art stimulated by what happened in England last week. Indeed - it would be very strange if I didn't. It will be really interesting to see what it generates. For the record here are my three posts earlier this week. I took much solace from those who shared their experiences of disturbances and the fact these things happen from time to time. Anyway - the bottom line for me is I've not looked at a lot of blogs this week! Plus I've only got round to asking one person whether I can use their image in this blog post. 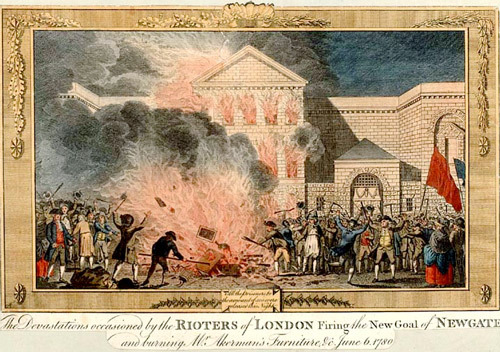 Plus Jonathan Jones (Guardian / Jonathan Jones on Art Blog) did a fascinating and very informative piece about How artists captured the violent riots of London's past. As he points out, burning furniture stores - because they burn well - is not a new idea! It all served to remind me of how a number of the Impressionist painters had to cope with the Franco-Prussian War of 1870 and the prolonged siege of Paris in the middle of the development of their ouevre. Which does rather tend to put things into perspective! I like David Pilgrim's (David Pilgrim - paintings and drawings) Whaddon sunset studies - sunsets are tricky! Thierry Guetta aka Mr Brainwash. On Friday I posted DVD Review: Lucian Freud Portraits. Then on Saturday, the Imagine film Sitting for Lucian Freud - which is in essence the film as per the DVD - was shown on the BBC! It's now available to view on iPlayer (click the link) and is recommended viewing. Roz Stendhal (Roz Wound Up) announced that My Favorite Paint Box Is Back—for a Limited Time. It's a Schmincke Horadam IAMART Limited Edition Half-pan Tin with 12 Colors. 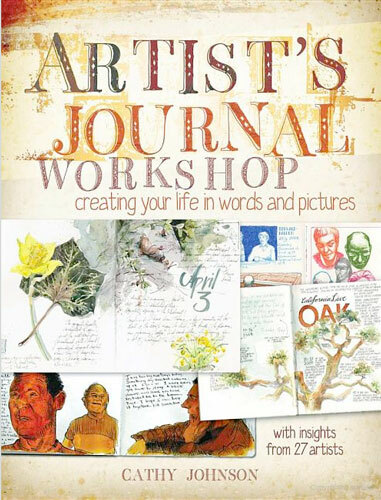 The Royal Birmingham Society of Artists has a few places left at its summer school for adult learners. Working from photographs - Terry Miura (Studio Notes) has provided his perspective in Using reference photos. Using Liquin Mediums with oil colour: demonstrates how to use the Winsor & Newton Liquin family of mediums and what their different properties are. When trying to decide what your strategy should be re Google+, try reading this article Google Plus – Innovators and Early Adopters on Experian Hitwise. Segements wise "Colleges and cafes" have been replaced by "kids and cabernet". in just over six weeks, we’ve moved from innovators to early adopters to early mainstream users visiting the new social network. One of the things which distinguished the Hodge Award was that it was about a body of work. I thought the following quote about the award was of relevance to artists as well. It certainly made me pause and think. Posted by Making A Mark on Sunday, August 14, 2011 2 comments Who's linking to this post? Categories art, art blogs, Art Business and Marketing, art competition, making a mark, Techies, webware, who's made a mark this week? Posted by Making A Mark on Saturday, August 13, 2011 2 comments Who's linking to this post? Posted by Making A Mark on Friday, August 12, 2011 9 comments Who's linking to this post? Posted by Making A Mark on Thursday, August 11, 2011 2 comments Who's linking to this post? 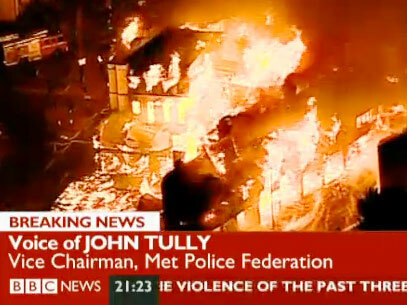 Many, many thanks to all those who sent me notes and left messages via Facebook or Twitter re the riots in London. When I was very tired and emotional and not knowing quite what to do your messages were a real boon! To be honest I can't actually remember the last time I was scared as I was on Monday evening when I heard there were youths coming down my road with steel poles. The looting and disorder got very close to my front door but thankfully stopped short. Initially I'd thought that living so close to the Olympic stadium would mean we'd be safe. What I didn't realise was quite how matters were going to develop on Monday night and quite how many police would be needed to restore order. For those who have not seen it before this is the map of the extent of the verified incidents mapped onto a map of deprivation in London. It's very clear from this that huge areas of London which are deprived chose not to riot and that riots also occurred in leafy suburbs. I'm very clear in my own mind that there is absolutely no excuse whatsoever for arson, burglary and theft. To say otherwise is enormously disrespectful to all those who live in deprived areas and who are good citizens. I'm very inclined to think that, whatever its initial cause, this very rapidly became about greed, teenage kicks and a mindset which assumed that nobody would catch them and no real sanction would be imposed. All I can say is thank goodness for CCTV cameras and magistrates who are referring sentencing to the Crown Court since they can only impose prison sentences of up to six months. Maybe that will get the message home. Maybe that will become a real deterrent to any notion of repeating what happened this week. This afternoon we went for a long walk round where I live - and the total absence of teenagers on the streets was very noticeable. Maybe they're beginning to get the message that this time there will be no cautions. One comment I got on facebook is I think worth repeating. I won't repeat who said it as I haven't asked her - however I'm happy to attribute. They hurt themselves, too, in the LA riots (and I will not dignify them by calling them by the PC term "civil unrest". The merchants simply didn't rebuild in the burned out areas. And then the residents complained that the good retailers were dissing them by not going back in. Well, duh. You can't force someone to rebuild when they know they'll eventually be burned out again. The insurance costs must have been through the roof. So who lost jobs, access to close by shopping and other aspects of the economic engine? They did, in the long run. PS I wouldn't mind in the least if that nice policeman in Manchester with the plain speaking and the action orientation came and ran the Met Police! Posted by Making A Mark on Wednesday, August 10, 2011 7 comments Who's linking to this post? 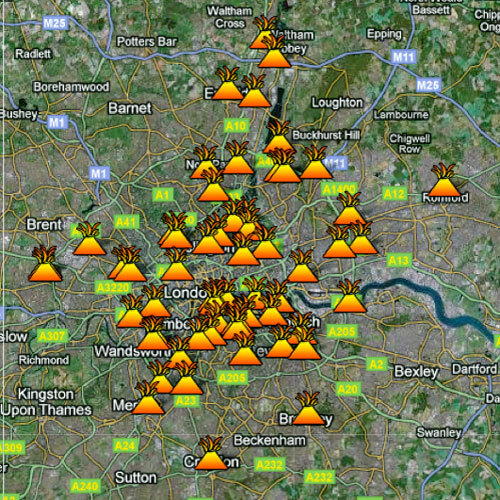 This is a Google Map of the places in London affected by the rioting. The looting and arson has been organised as well as opportunistic and very extensive. This is an account of the third night of rioting as it happened - with pics. It's now time for the communities around London to pull together. Local communities (ie ordinary people) are organising a Clean Up of the Riot Areas starting tomorrow morning - assuming they can get past police lines. Let's just hope somebody works out very soon how this horrendous and horrifying behaviour can be stopped in its tracks. Posted by Making A Mark on Tuesday, August 09, 2011 11 comments Who's linking to this post? No blog post today as I'm rather distracted by the fact that violence, looting and arson are going on not far from where I live as well as places across London. I'm not inclined to get in a car and move out as cars are being hijacked and set on fire. I live a mile from where the Olympics are due to happen a year from now. Posted by Making A Mark on Monday, August 08, 2011 22 comments Who's linking to this post? I'm very pleased to highly the Annual Summer Exhibition of the Royal Society of Painter-Printmakers (RE) which I unaccountably forgot to highlight in last week's post. I've provided the details below. However I particularly wanted to feature the work of one particular RE member HJ Jackson as I own one of his linocut prints. HJ Jackson is also just two years off 60 years of printmaking! He lost access to a printing press when he left art school and ever since then has been burnishing all his prints by hand using a tobacco tin. Below is a video of an interview with HJ Jackson at the Norwich Art Fair - talking about he works the process of producing a linocut from reference to print. It's maybe worth making the point that I always take a look at the art blogs of those who leave comments on this blog or sign up to follow me on Twitter. Quite a few people who get highlighted in this post on a Sunday first come to my attention in this fashion. However I hasten to add that if I'm interested I do look back over the blog to see what the standard has been like over time! However please don't be like one artist who recently followed me who listed a website that didn't work properly and mentioned a blog for recent artwork which the website did not link to! One of my new Twitter followers twitterstream (hello Daniel Cruit! 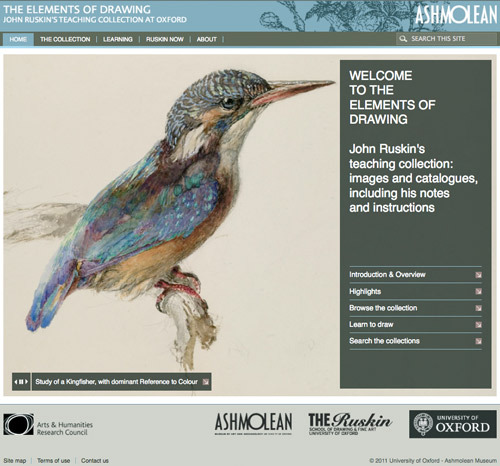 ), suggested I check out Edward Kinsella's sketchblog - so I did - and I suggest you do also. 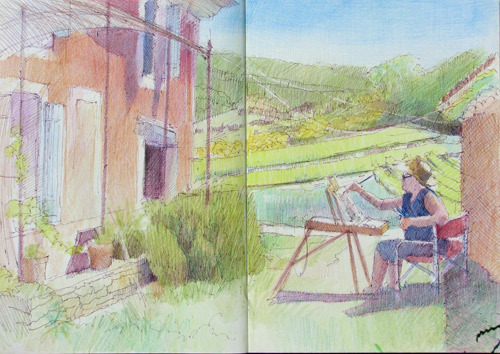 Jan Blencowe (Jan Blencowe The Poetic Landscape) has been on a Maine Painting trip - which she posted about in four parts - together with some very nice paintings and some good stories! Ruth Andre (A Painting Day) primarily paints horses. I do like bloggers who have a short interesting story to go with the images they post. My new photography blog Makingamark - a daily photo is off and running and I'm beginning to get into my stride as I revisit my photos - which of itself is a jolly good reason for doing it! I've adopted an alphabetical approach as it gives me a structure and focus that means I cannot wander - except I spent most of this week coming up with thoughts for a huge number of letters of the alphabet. Not got Z sorted yet! Artists, Is Your Income Feast or Famine? “Sometimes instead of buying from a showroom,” she says, “you can buy directly from the artist at a better price." The blogs and newspapers have been curiously quiet about the implications of the latest falls on the stock market and their impact on the art market. I'm going to watching for comment. I kind of think wiping out $3 trillion dollars from the global stock markets has to mean something. 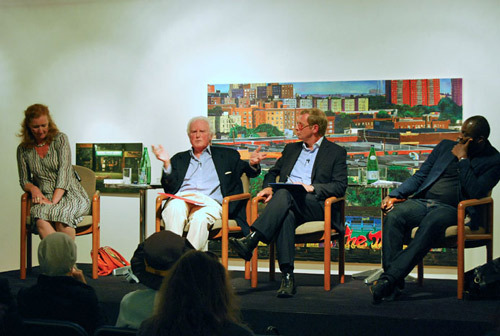 I've found certain shows very political inasmuch as they won't consider artists without art degrees. Do you have any suggestions for non-degreed artists regarding shows and artist resumes, etc.? Joanne Mattera (Joanne Mattera Art Blog) comments this week on the jury process she has recently been involved in - Maketing Mondays: What the Juror Saw. She provides some interesting observations about her perspective on the process - such as the one below. What constitutes a No? For me it’s work that looks derivative (if Sean Scully has already done it, you don’t have to), conceptually undeveloped (what, exactly am I looking at and why? ), formally unresolved (it doesn’t “work”) or technically inadequate (incompetent execution). 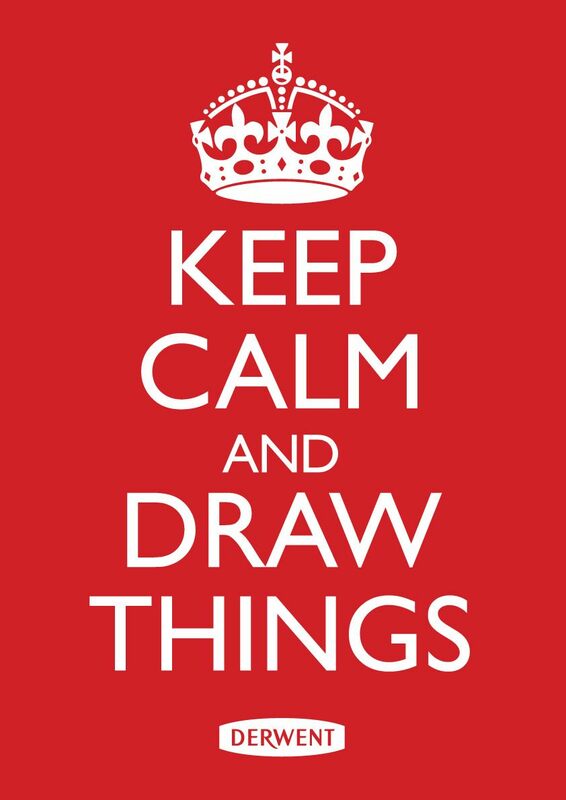 I've given up following Art Knowledge News on Twitter. The site has become extremely tedious through a combination of incessant tweets and tweets/posts about exhibitions which finished a long time ago. This is just one recent example - there's lots more. 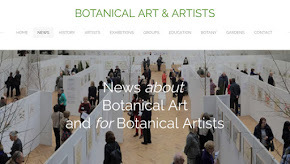 My post Elizabeth Blackadder - a retrospective is about the new exhibition at the Scottish National Gallery. The BBC provides a slideshow In picture - the Edinburgh Art festival. Here's Adrian Searle's review in the Guardian Jake or Dinos Chapman - review - he gave them just three stars! Having heard some tales about their characters and behaviour in real life (ie outside an art gallery) I think this will be their first and last mention on this blog. What unites them is that it is all in the worst possible taste. The Royal Society of Painter-Printmakers have their Annual Summer Exhibition at the Bankside Gallery - which I popped into this week (but need to go back to for a proper look). 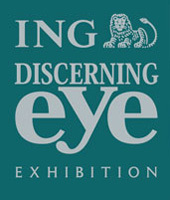 The exhibition continues until 21st August. The Bankside Gallery is right next door to Tate Modern on the south bank. Sarah Wimperis - Contemporary Impressionism at Beside the Wave Gallery, Falmouth opened yesterday Saturday. 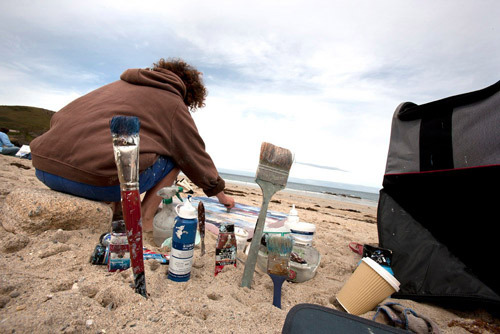 Plus here's the gallery blog on the topic of the exhibition Wimperis, Hoskin and Helford. It's very weird looking at pictures in an exhibition when you were stood or sat next to the artist when they were being painted in Provence! 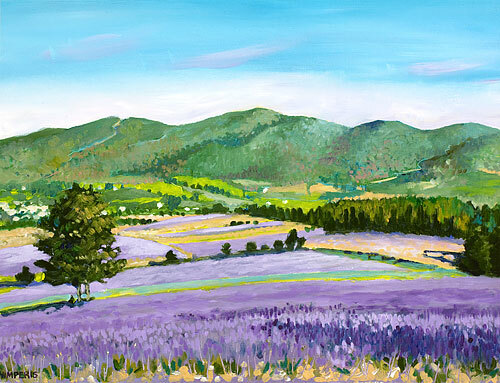 I think we packed up on our plein air trip to the lavender fields some time after 8pm at the end of June. 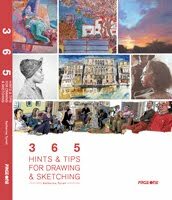 the best new art books in the previous 30 days - or in the case of this month - the last 90 days - see The Best NEW Art Books. Stealing the Mona Lisa or how being stolen made the Mona Lisa's day! Leonardo da Vinci's Mona Lisa was stolen from the Louvre 100 years ago this month. The great Goya robbery – from National Gallery to Dr No's lair - Here's the story of what happened - it's an entertaining story which led to a change in the law so that paintings in national collections could not be "borrowed". 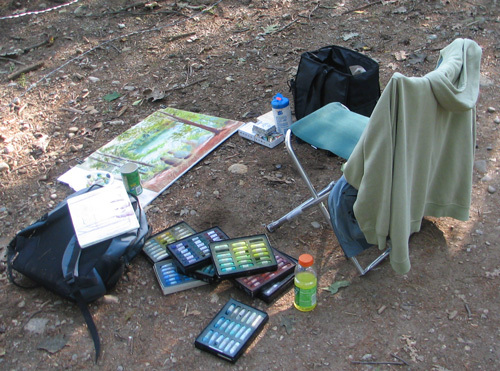 here are some small painting tips - about edges and tones - from Daniel Cruit. He's a 19-year-old Floridian art student, currently a freshman Illustration major at Ringling College of Art and Design- and seems to talk sense! 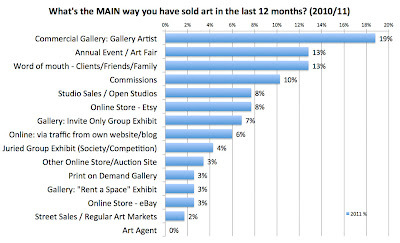 On Monday I launched the Poll for August - which is for the fourth year running is the ANNUAL POLL: What's the MAIN way you have sold art in the last 12 months?. It's getting lots of responses. 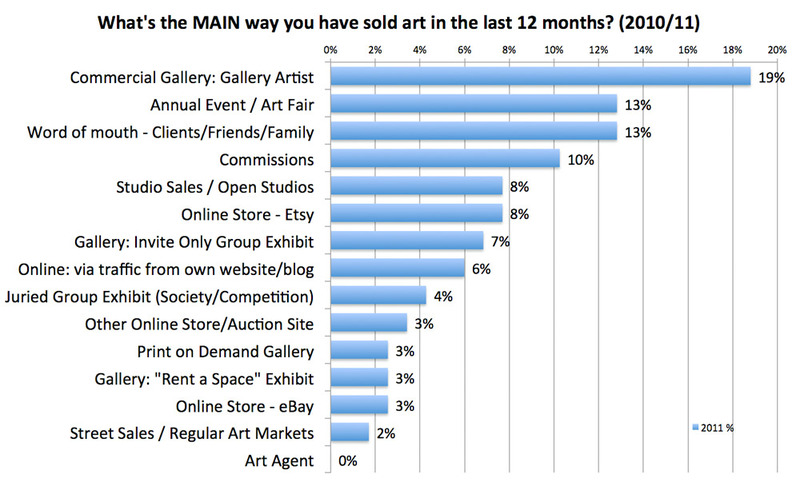 Please make sure you share with all those artists you know who are selling their art. The more responses we get the better the analysis of what works and what doesn't. A giant sculpture by Oliver Voss, 'Die Badende' (The Bather), lies in the Binnenalster lake in Hamburg, Germany. The sculpture is made of styrofoam and steel and measures 4 metres high by 30 metres long. Posted by Making A Mark on Sunday, August 07, 2011 5 comments Who's linking to this post? Categories art, art blogs, Art Business and Marketing, art competition, drawing, exhibition, painting, sketching, who's made a mark this week?